I have received a lot of questions on how we process our chickens. I have tried to explain it but think that having a few pics will help clear a few things up. The first thing to do is to kill the chicken. I have heard of several ways. Murray McMurray sells special cones that you place the chicken in head down and cut and bleed it. Some folks will break the neck then cut and bleed. 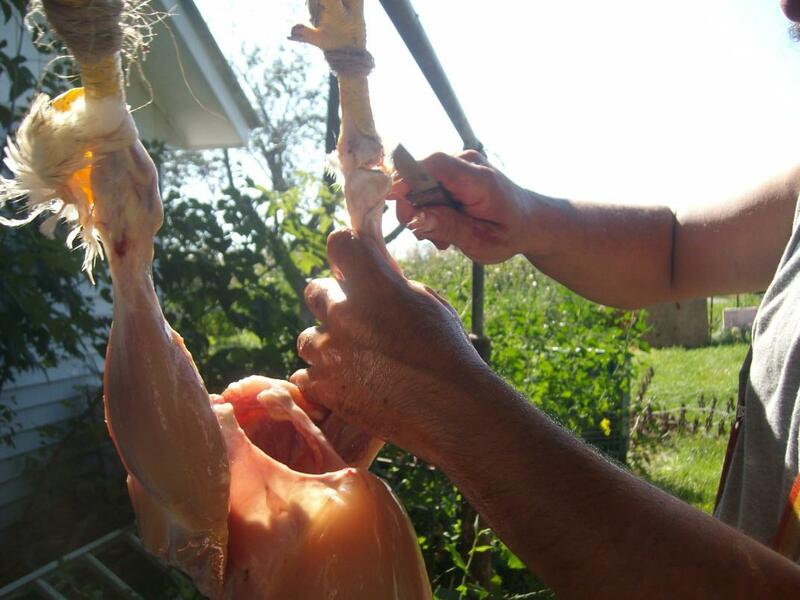 I have a buddy who told me how his Grandma will go out barefoot, and place the chickens head under her foot and yank it off. 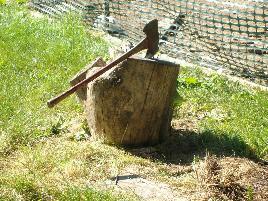 We have found the old axe and chopping block to be very effective and humane if you use the proper stuff. The first year I had a smaller hatchet and once in a while it wouldn't sever the head completely. I now use a good sized double bitted axe and lop the head off with one stroke all the time. We pounded a couple of nails into an old piece of elm and made a really sturdy chopping block. 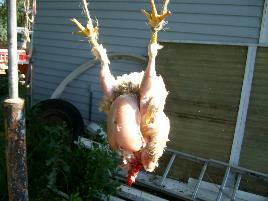 We lop the head off then put the chicken off to the side to bleed out. They will flop around a bit so watch where you put it. 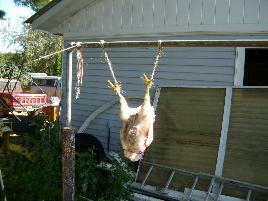 You need a good place to hang the bird while working on it. A nice low hanging branch will work but we have an old clothes line stand that serves quite well. We use twine off a bale to hold the legs. You want them apart a bit so you can get at the bird decently. After it is hung we cut the wings off at the first joint. I do not care to gnaw around the rest of the wing and with the size of these birds the first bit of wing is quite large, almost as big as some drumsticks I've seen. It may take a couple of tries to figure out where the joint is but once you know it's quite simple to do. After the wings are off grab the skin right in the middle of the breast, pull out a bit and insert your knife just enough to pierce the skin. Slice up and down a bit. Once a hole is made you can use your fingers to tear the skin and seperate it from the flesh down to the neck and up to where the keel ends. Pulling the neck and crop away from the skin at this point helps out later. The next part is a bit tricky and hard to get a good picture of. It takes a bit of looking and a bit of practice to make things work smoothly. After you get the skin off the flesh around the front you need to work towards the back right above the wings. If you look carefully, you will see some tendons which look like white strings that hold the skin to the flesh. You need to cut these with your knife tip so that the skin will pull off easily. Once I get them or think I get them severed, I will pull on the body skin with one hand while working the thumb and forefinger around the base of the wing to separate the skin from the flesh. Once you get your finger and thumb around the base you can pull the skin right off. It takes a bit of effort and you may have to go back with your knife and cut any tendons you missed. 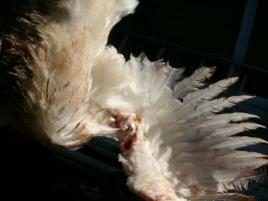 Once the wings are skinned you can start on the legs. I slice up from the original cut on the breast. Once I get up a bit I will work two fingers up between the flesh and the skin to guide the knife in. I make a cut all the way up past the knee joint to help get all the feathers off when I cut the legs off. 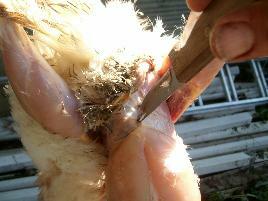 After the cut work the skin away from the flesh, then grab the leg skin and pull upwards. It should break above the knee joint yet stay attatched to rest of the skin. If you do it right it will look like this. Once the legs are free, I start working the skin up the back of the bird. Most times you can just grab it and pull upwards. I keep my hand on the birds back and use a rolling motion. Sometimes you may have to use your knife to cut any tendons that don't break and cause the flesh to tear. 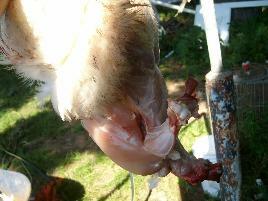 I stop pulling and sever the tail about an inch from the end to get rid of the preen gland that is located there. Cut all the way through the tail bones and around the side of them. Do not cut too deep as the vent is right there and the intestine is just below the bones. Sever any tendons that hold the stuff together. Once the tail bone is cut I pierce the flesh right at the back of the keel. Not too deeply, just enough to cut. Then I slice carefully between the spot and the tailbone cut. Once you're done you should have the whole skin attatched by the vent to the intestines. Here is where I cut by the keel. Work a couple of fingers into the hole you made and separate the innards from the body cavity, then carefully pull out. There is a bile sack on the liver that you do not wnt to break. I try to work my hand in and feel for the tube that is connected to the crop. I pull some intestine out then grab the tube and pull. After the guts are out you will have to reach in and pull out the heart and lungs which are behind the diaphragm. 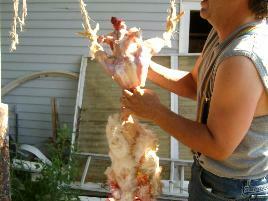 Once you have the skin off and the guts out you can spray the carcass off with a garden hose. Spray the cavity out good too. Then cut off the legs at the knee joint and process, if you get ahead of the processor you can pop the carcass into a pot of cold water and start on the next one. There are different ways to process the bird. We keep some whole for baking but without the skin they can get dry that way. We usually take the breasts off and the legs/thighs and wings. 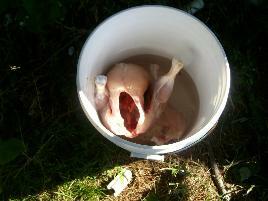 We keep a few of the carcasses around for making chicken soup. 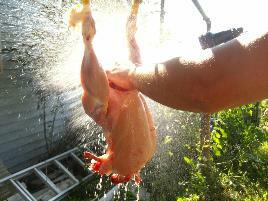 We freeze the parts and it takes about 2 gallon bags per bird. We have canned chunked breast meat and that is a great time saver for making quick meals. I highly recommend it. Maybe some day I will post pics of the cutting up for those that haven't done it before.